Maps and borders notwithstanding, some places are best described as "gaps"--places with repeatedly contested boundaries that are wedged in between other places that have clear boundaries. 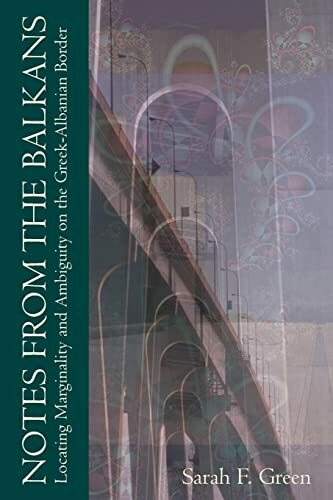 This book explores an iconic example of this in the contemporary Western imagination: the Balkans. Drawing on richly detailed ethnographic research around the Greek-Albanian border, Sarah Green focuses her groundbreaking analysis on the ambiguities of never quite resolving where or what places are. One consequence for some Greek peoples in this border area is a seeming lack of distinction--but in a distinctly "Balkan" way. In gaps (which are never empty), marginality is, in contrast with conventional understandings, not a matter of difference and separation--it is a lack thereof. Notes from the Balkans represents the first ethnographic approach to exploring "the Balkans" as an ideological concept. Green argues that, rather than representing a tension between "West" and "East," the Balkans makes such oppositions ambiguous. This kind of marginality means that such places and peoples can hardly engage with "multiculturalism." Moreover, the region's ambiguity threatens clear, modernist distinctions. The violence so closely associated with the region can therefore be seen as part of continual attempts to resolve the ambiguities by imposing fixed separations. And every time this fails, the region is once again defined as a place that will continually proliferate such dangerous ambiguity, and could spread it somewhere else.